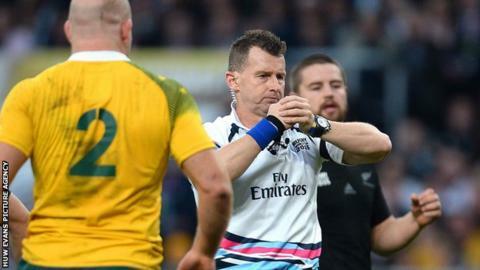 Referee Nigel Owens will take charge of a record 71st Test match when he runs out for Fiji v Tonga in Suva in June. The 44-year-old Welshman will overtake South African Jonathan Kaplan to become the most experienced international referee of all time. Owens took charge of his test debut in 2003 when Portugal beat Georgia 34-30 and refereed the 2015 World Cup final. "It's an honour to be appointed to this important match and I will prepare in the same way as I always do," he said. "Reffing the Rugby World Cup final was a wonderful experience and one that I will treasure forever but every match is memorable in its own way and I am really looking forward to this next challenge in Fiji, where I have never refereed before. "I have been fortunate to have so many people supporting me along the way - friends, family and other past and present referees as well as the WRU and World Rugby." Owens has taken charge of 16 Six Nations matches and 12 in The Rugby Championship as well as three European Cup finals.